Indeed, just as the meeting began, Americans for Peace Now (APN) delivered a petition with nearly 16,000 signatures urging President Obama to press for that extension. I applaud APN’s effort, and the petition was the right thing to do. But I am also relieved that, apparently, Obama did not heed that call. As APN President Debra DeLee said, “These thousands of voices are expressing what we all know: Peace for Israel is more important than settlement expansion. 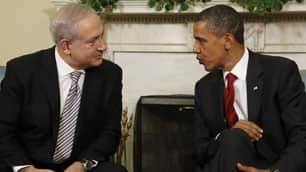 American leadership toward a two-state solution is essential, and Israel’s future depends on reaching such a solution.” Just so, and therefore the petition is sending the right message to both President Obama and Prime Minister Netanyahu. The petition made its point, got good coverage and quite probably caught the attention of both world leaders. It therefore did everything it needed to do. But it did not, from all appearances, convince Obama to press hard on Bibi for an extension of the freeze, and that is to the good. The political forces in Israel have been gearing up for a fight over extending the freeze. Hardline supporters here in the US have been similarly floating warnings, focusing on the November mid-term elections. Obama spent a great deal of political capital to get the freeze, and the price for renewal was looming even larger. And what did the freeze accomplish? On the ground, very little. With the many exceptions the US tolerated – projects that had already begun, construction in East Jerusalem, and a few other exceptions – Palestinians have seen very little change on the ground. A good many plans have also proceeded, but the final stages are being held up. That could well mean that when the moratorium ends, there could be a tidal wave of new construction. This, of course, is precisely why Peace Now wants the freeze extended, despite the many loopholes in it. If it is extended, the plans that have proceeded will continue to be jammed up and the projects that have continued will be completed. So an extension means effects would actually be visible. But the price would be awfully high. From the Israeli point of view, the freeze has not brought many benefits. The internal political struggles have not led to any progress with the Palestinians. And from the Palestinian point of view, Israelis are fighting among themselves, but have changed very little with regard to the settlement project. Indeed, they have compensated for a reduction in activity in the West Bank with a visible increase in settlement in East Jerusalem. That’s hardly seen as a worthy trade in Palestinian eyes. Extending the freeze would certainly be a positive thing, but in this game, we must always look at the balance sheet. And in this case, the price for a public extension of the freeze would be too high for Obama. That doesn’t mean that Netanyahu can’t continue to put some brakes on the settlement process, and it is quite possible that Obama persuaded him to do so. It is not at all uncommon for an Israeli Prime Minister to quietly block some settlement plans for a time. If direct talks with the Palestinians are actually going somewhere, Obama will have gotten what he wants and Netanyahu will be able to slow down settlement activity enough to keep talks going, while approving some projects to keep his right wing at bay. But we then get back to the same old problem. How, exactly, can such talks really move forward? The opportunity is there, and Mahmoud Abbas may have provided it over this past weekend. He is reported to have sent an offer to American mediator, Senator George Mitchell, where the Palestinians would agree to specific land swaps amounting to 2.3% of the West Bank and would allow the Jewish Quarter of the Old City of Jerusalem, including the Western Wall, to remain under Israeli sovereignty. That is a real opening for direct talks. But it only represents an opportunity if Israel is willing to seriously consider an outcome that looks something like the various plans that have been around for some time (the Geneva Initiative, the Clinton Parameters, the Beilin-Abu Mazen Agreements, the Nusseibeh-Ayalon Accords, etc.). It’s just a little hard to believe that a Netanyahu-led, radically right wing government would ever seriously negotiate to such an end. In his remarks to reporters today, President Obama said that the people in the region needed to see action, not more talk, not more process that leads nowhere. It’s a nice sentiment, and I think Obama means it. But until there’s a unified Palestinian government, and until there’s an Israeli government which understands that it will have to vacate the West Bank and share Jerusalem, it’s not likely there will be much real progress. The only thing that can change that is strong American pressure, as many Israelis and Palestinians recognize. But until the domestic counterweight against the forces that passionately oppose peace by opposing such American action comes into being, any President is going to be constrained by domestic concerns. Obama today planted some seeds. AIPAC and other opponents of concerted American action have been mollified, especially by Obama’s pledge to allow Israel to retain its nuclear ambiguity. He needs to bank that goodwill, ride it through November, and start using it wisely to create the conditions where American pressure is more feasible, and then apply that pressure. And J Street and APN need to continue to build their own influence. If the counterweight they represent can grown significant enough to provide the political cover necessary for 2012, Obama can move. But that’s a lot to ask. From where we sit today, not a whole lot promises to change. This entry was posted on July 6, 2010 at 8:25 pm and is filed under Uncategorized. You can follow any responses to this entry through the RSS 2.0 feed. You can leave a response, or trackback from your own site. I assume your “relief” relates to the political cost that Obama would pay for supporting this freeze. But do you seriously think this president is going to be a 2nd term president, or even a candidate? Do you think that the president should necessarily ape the motions that his own party go through in congress? I vote for Obama being a good one-term president who actually earned his Nobel Peace prize.